Ninnaji Temple (仁和寺) is a large temple complex in eastern Kyoto, Japan, founded in 888 by the retired Emperor Uda. It is part of the «Historic Monuments of Ancient Kyoto», a UNESCO World Heritage Site. 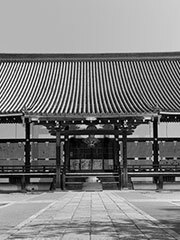 From 888 to 1869 it was traditional for reigning Emperors to send a son to the temple to take over as head priest when a vacancy arose. Most of the surviving buildings date from the 17th century, and include a five-storey pagoda and a plantation of dwarf cherry trees. The temple itself features some beautifully painted screen walls, and a beautiful walled garden. Behind the temple there is a miniature version of the renowned 88-temple walk in Shikoku.